Often simply called "Caesar," Caius Julius Caesar (100 BC - 44 BC) is the most well-known Roman. He rose quickly through the cursus honorum as a young man, and eventually conquered Gaul as general following his co-consulship with Bibulus. His Gallic campaign is arguably his best war effort, and he memorialized his campaign in "De Bello Gallico." Caesar became Roman Dictator, but was murdered by Roman Senators on the Ides of March (March 15) 44 BC. Caesar led to the end of the Roman Republic and the start of the Roman Empire. 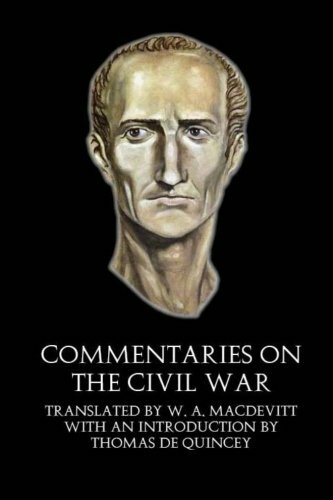 In his commentaries on the Civil War, Caesar writes about the great war that plagued Rome between Caesar and Pompey. W.A. MacDevitt's rich translation paints the perfect picture while Thomas De Quincey's Introduction showcases the political and social scene at the time. This illustrated version brings the Civil War to life.